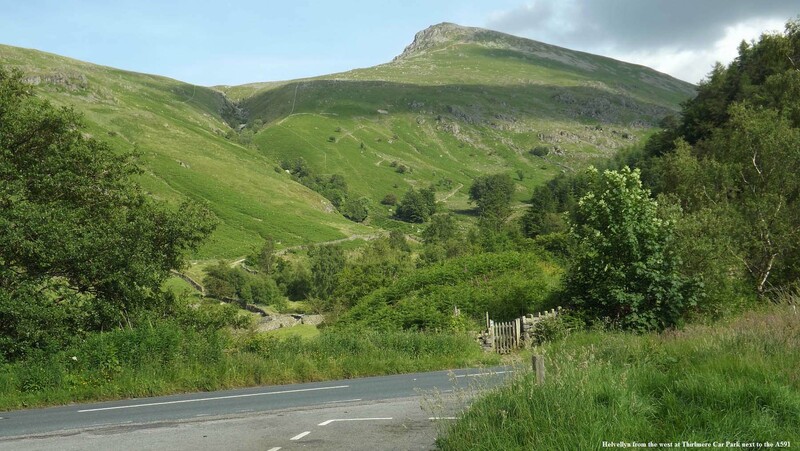 This page gives information on the mountain Helvellyn for hiking from the west, from the scenic car parks at Thirlmere and Wythburn, both next to the A591 that runs between Keswick and Grasmere, regular buses stop at these two car parks. The car parks are situated about 7 miles south of Keswick. Keswick to Thirlmere Road Map . The image below is from the west side car park at Thirlmere. These are pay and display car parks with toilets and phones, and at times an ice cream van. There is a similar car park 2 miles south at a little church named Wythburn. There are also a number of scenic walks around this area for anyone not wanting to hike the mountain. There is a popular free car park a few hundred yards north, that is a large layby. That is Helvellyn Lower Man at 3,034ft you can see there, Helvellyn is not far behind. This is a fairly steep route up. Large Image. The image below is of the Thirlmere Car Park on the east side of the road for the Helvellyn hike. The trail to Helvellyn starts at the bottom of the car park. The image below is of the Helvellyn trail as it runs up beside Helvellyn Gill. There is a good fairly safe trail like this all the way to the top of Helvellyn Lower Man, and on to Helvellyn itself. The image below is by Alan Waters from his hike to Helvellyn. This view is from the top of Helvellyn, looking down the east side to Stridding Edge. Stridding Edge has a path over the top, and a path just down from the top most of the way, both require a head for heights. Most people that Hike Stridding Edge start out from Glenridding or Patterdale. 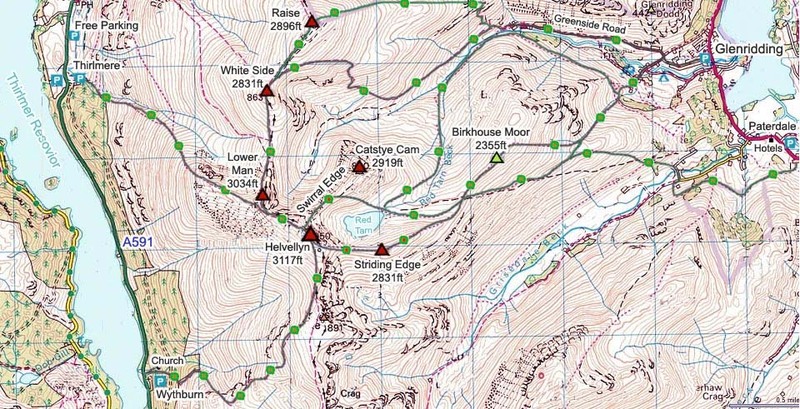 The Helvellyn Map below shows the west side routes from Thirlmere and Wythburn. It also shows the east side routes from Glenridding and Patterdale. Helvellyn is an interesting mountain with a number of real good routes to suit most hikers.